RECON, a premiere manufacturer of aftermarket lighting for Trucks and SUVs, announces their new Platinum White/Blue Xenon 5,600 Kelvin Headlight Bulbs. Theres no reason to settle for the ugly, yellow, dim light emitted by your factory installed headlight bulbs when its so easy to upgrade to a better solution. � Super high-output proprietary white w/ a touch of blue XENON gas mixture produces up to 250% more usable light than factory installed halogen gas-filled bulbs. 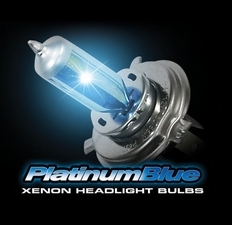 � RECON Platinum Blue headlight bulbs are up to 150% brighter than competitive xenon gas bulbs. � Every RECON Platinum Blue Xenon headlight bulb meets or exceeds an 11,000 hour average life expectancy. � RECON Platinum Blue headlight bulbs feature the widest beam angle of any XENON headlight bulb offered in the automotive market today. These Bulbs are Size H7. Please confirm that your vehicle uses H7 sized bulbs BEFORE purchasing these lights.